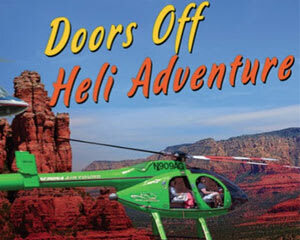 You get 15 minutes featuring Sedona’s most coveted landmarks and formations, and all with the doors off! If you want a no-fuss Sedona sightseeing fix, this nifty helicopter tour packs a punch! You get 15 minutes featuring Sedona’s most coveted landmarks and formations, and all with the doors off! Even though it’s a quick jaunt, your Sedona helicopter flight covers ample scenery, giving you perfect photo opportunities of Chapel Rock, Snoopy Rock, Bear Wallow Canyon and more. Take in the very best of the red desert! Hop into a Jet Ranger or MD520 helicopter with the doors off. Get 15-minutes of high-flying adventure over a slew of famous landmarks! Get unparalleled views of the 350-millon-year-old Three Nuns formations. Snap some photos of The Chapel of the Holy Cross, a sacred landmark erected 70 feet out of the red stone! Travel to Snoopy Rock (the formation actually resembles Charlie Brown’s beloved dog!) and Steamboat Rock. Before heading back, get magnificent views of Schnebly Hill! These 15 minutes offer a rush that you won’t find in most hour-long excursions. Book your tour now! If a passengers weighs more than 275 lbs. they are required to pay for 1.5 seats since the aircraft capacity is based on weight.